Tomorrow is the BIG DAY! 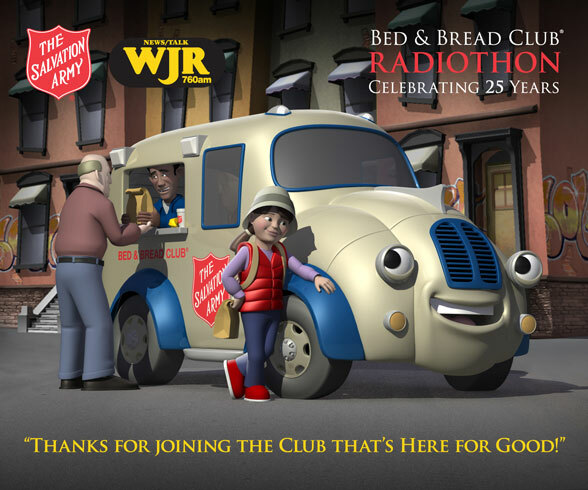 The 25th Anniversary Salvation Army Bed & Bread Club Radiothon kicks off Friday morning at 6am - live from the Oakland Mall on 760 WJR. And as always, it will run a full 16-hours until it wraps up at 10pm. I will be out at the mall, behind the mic one last time, along with “Purtan’s People”, and the guys from WJR as we raise funds for this amazing program which feeds 5000 men, women and children every day of the year. (Even on big snow days!) For many, it’s the ONLY meal they’ll get all day. While any amount you can give is appreciated, A donation of $120 (that’s $10 a month) feeds one person for an entire year; A donation of $240 (that’s $20 a month) feeds two people for an entire year and gets you a throw blanket featuring the artwork seen here. And not one penny goes to administrative costs - every single cent goes towards providing hearty soup, sandwiches, fruit, hot chocolate, coffee, lemonade - whatever the season calls for - to people who are desperately in need. And so now, once again, I’m asking you to find it in your heart to help those who are in less fortunate circumstances. I hope you will tune in as we broadcast live on 760 WJR; listen to the live stream on WJR.com; or stop by the Mall! You can even donate right now by calling 248-528-0760 or clicking on the following link. Donate Now. I thank you so much for your support and look forward to a busy and successful 25th Anniversary Radiothon tomorrow! Now… to hear one of my all-time favorite bits from the radio show featuring Howard Cosell at the Iditarod… go to DickPurtan.com!